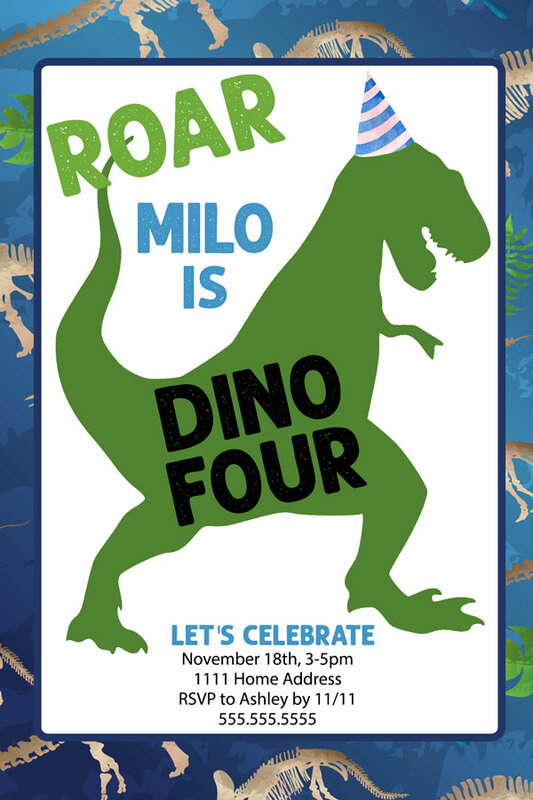 Have you been looking for dinosaur birthday party ideas for the little boy in your life? If so, you’re in the right place! 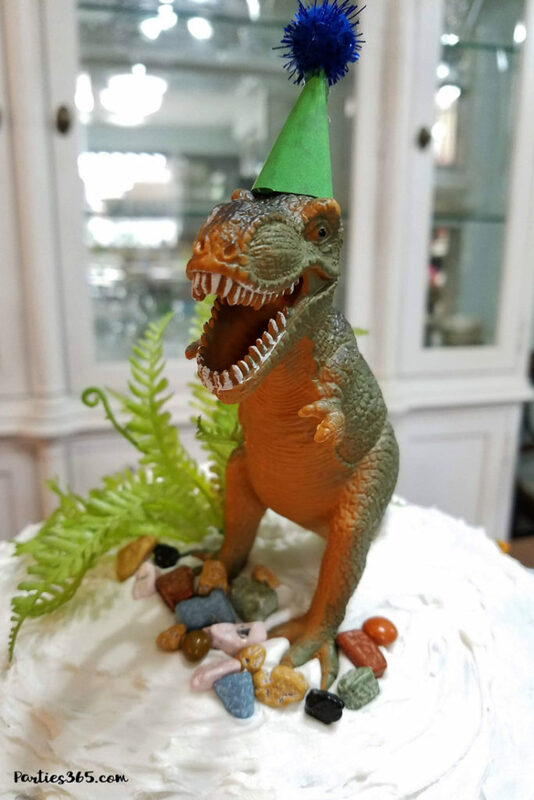 I recently threw my son a Dino-Four Birthday Party and I want to share all the easy DIY birthday ideas – and party printables – I used to make his party a roaring success! 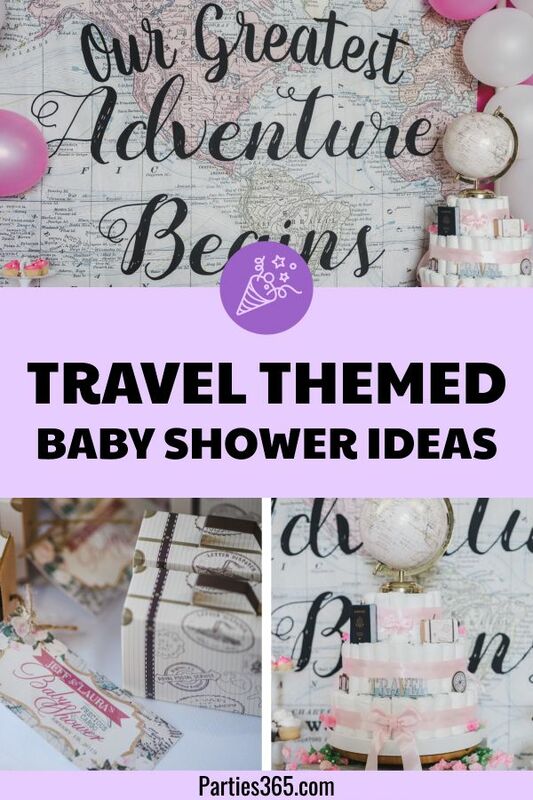 A dinosaur themed party is great for birthdays and baby showers and lends itself to so many fun sayings, activities, food and decor options. Take a look, follow in our tracks and you’ll have a fantastic dinosaur party planned in no time! I started planning our dinosaur party colors and decor around our Dinosaur Party Printable Pack, which has adorable dino prints with blues, greens and tans. 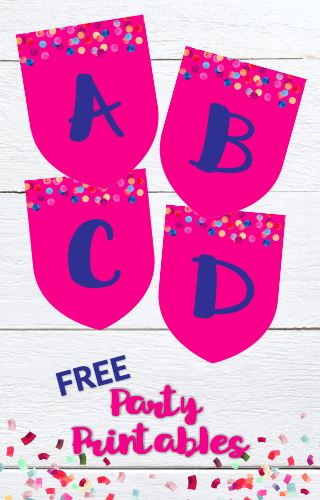 You can actually download the entire printable pack which has a birthday banner, cupcake wrappers and toppers, favor bag toppers, party hats and more for free because we added it to our Party Printable Library (yay!). 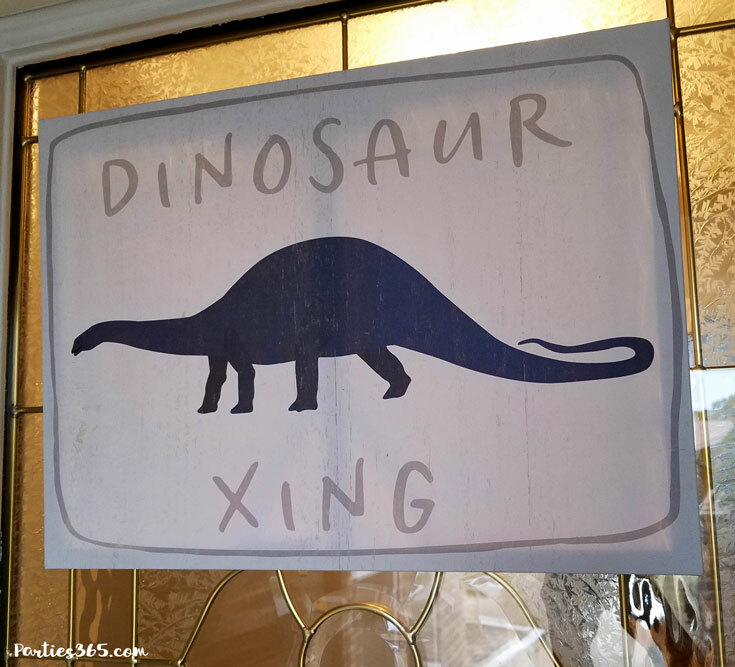 When guests arrived at the party they were led to the front door by t-rex tracks and came to a dinosaur crossing sign. 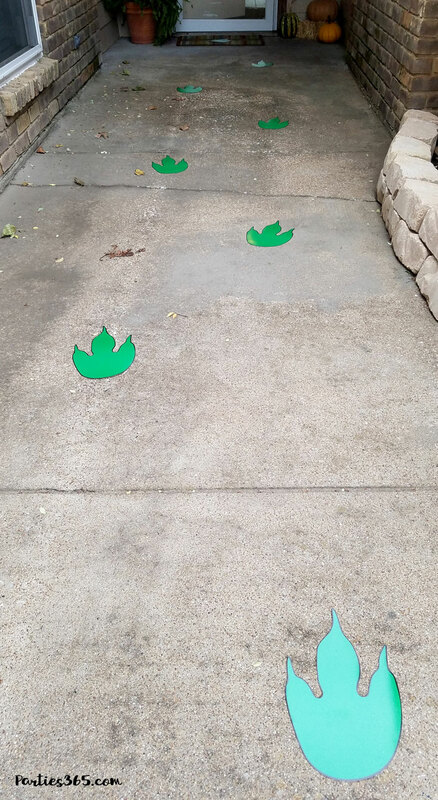 I found these green t-rex footprints at Hobby Lobby and we used some painter’s tape to adhere them to the front sidewalk. 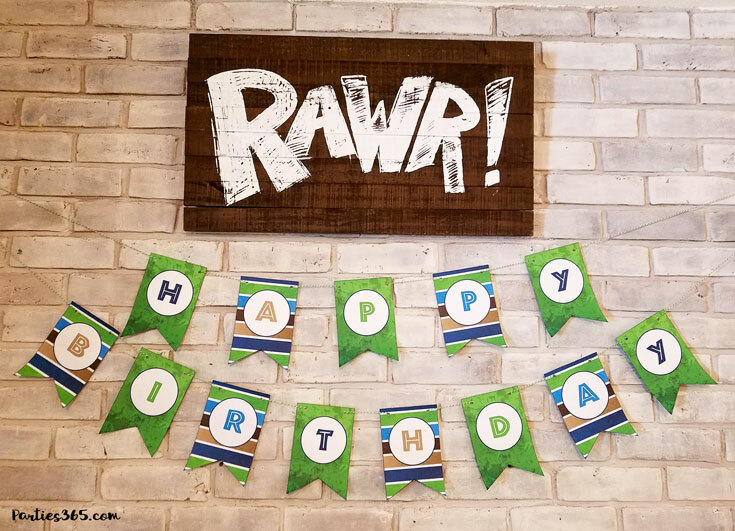 We created a feature wall on the fireplace with this adorable “RAWR” wooden sign and a “Happy Birthday” banner printed from our Dinosaur Party Printable Pack. 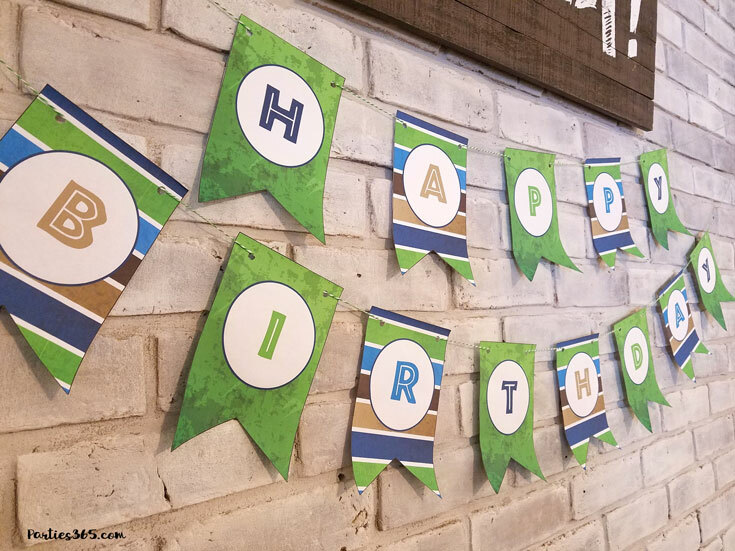 I strung the banner together using green and white baker’s twine and then attached a few balloons to the cute wooden brachiosaurus. We placed gifts along the fireplace and my son opened them here later in the party. 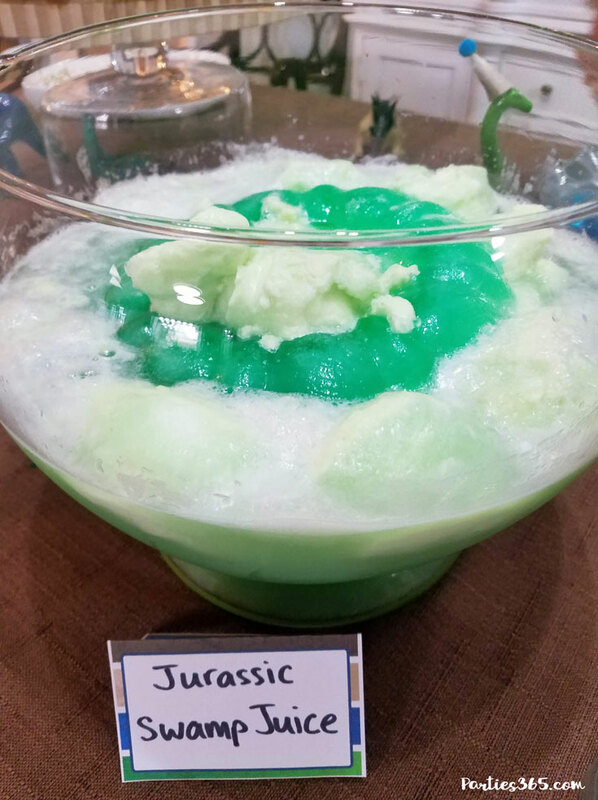 There are so many fun ideas for dinosaur party food, that the hardest thing will be deciding what not to include! We had an afternoon party and didn’t need to serve a meal, so I focused on cake, cupcakes, snack items and punch. Let me tell you, my son LOVED the cake I made and honestly, it was super simple! I baked a two layer round cake (from a box – shhh, don’t tell!!) and frosted it with white icing. 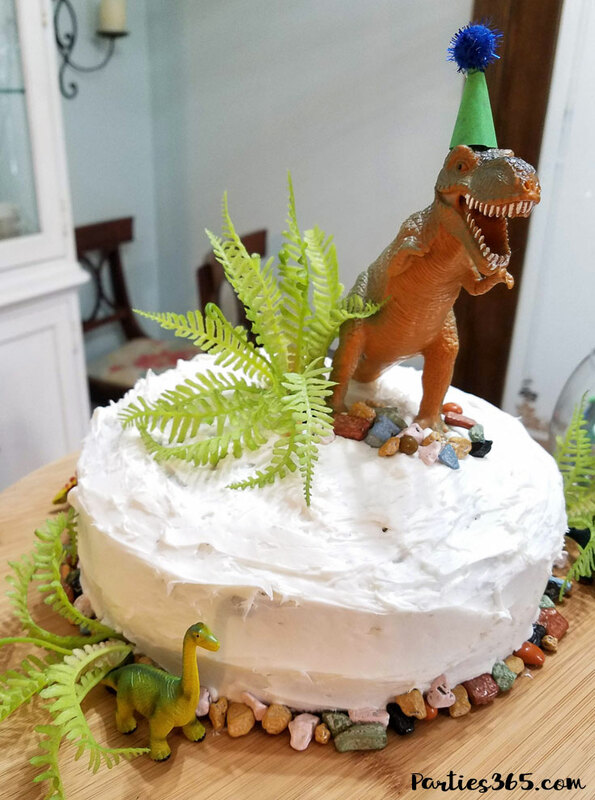 Then I topped it with a toy T-Rex wearing a homemade party hat and decorated the rest of the cake with chocolate rocks (they were a huge hit and tasted delicious) and some faux greenery from Hobby Lobby. 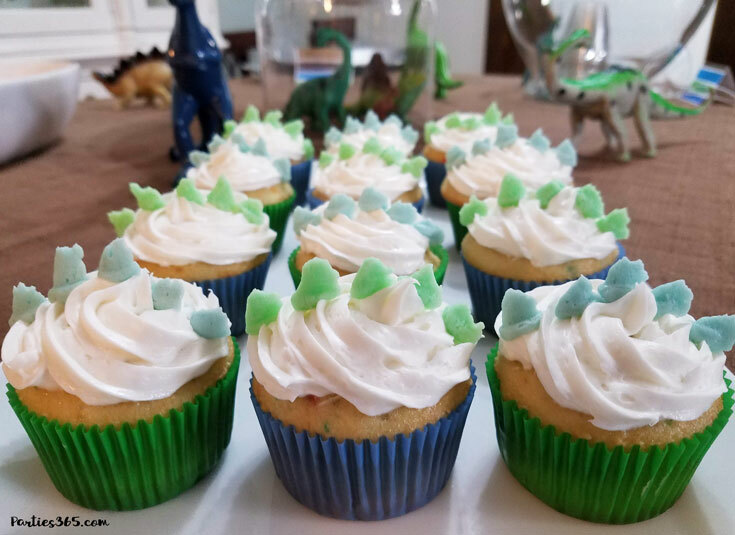 I also made these easy, but adorable Dinosaur Cupcakes! Sticking with my blue and green color scheme I alternated the colors of the spikes, which I created using a #104 piping tip. 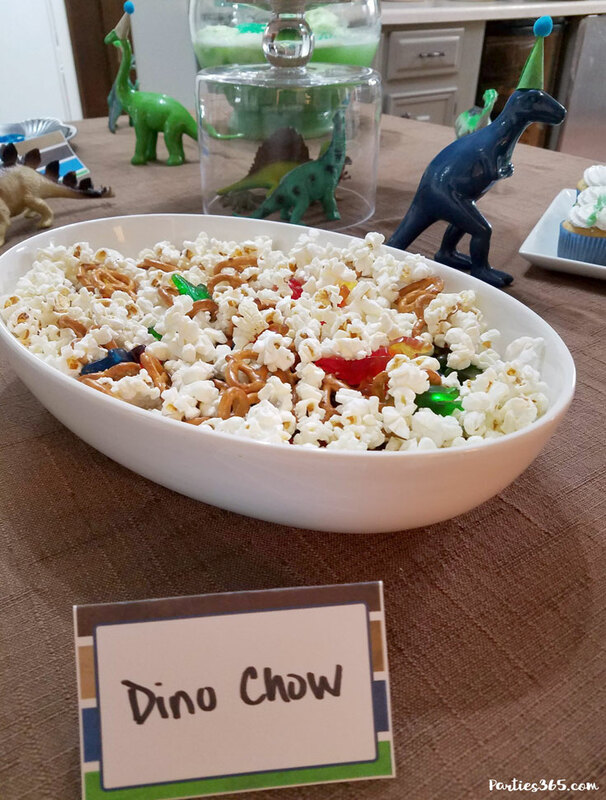 In addition to the sweet desserts, I created a “Dino Chow” by combining popcorn, pretzels and gummy dinosaurs (the shown place card is included in the downloadable Dinosaur Party Printable Pack )! 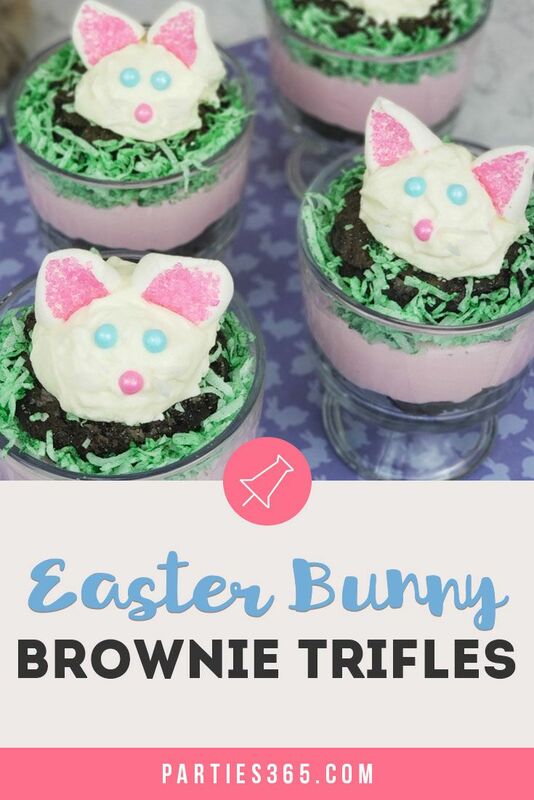 It was a huge hit with the kids and disappeared fast! Finally, to dress up the dessert table, I let the party dinosaurs freely roam between the snacks and even “trapped” a few of them in my makeshift cake stand by turning my glass trifle bowl upside down to hold the cake platter. You get creative and use what you have on hand, right?! 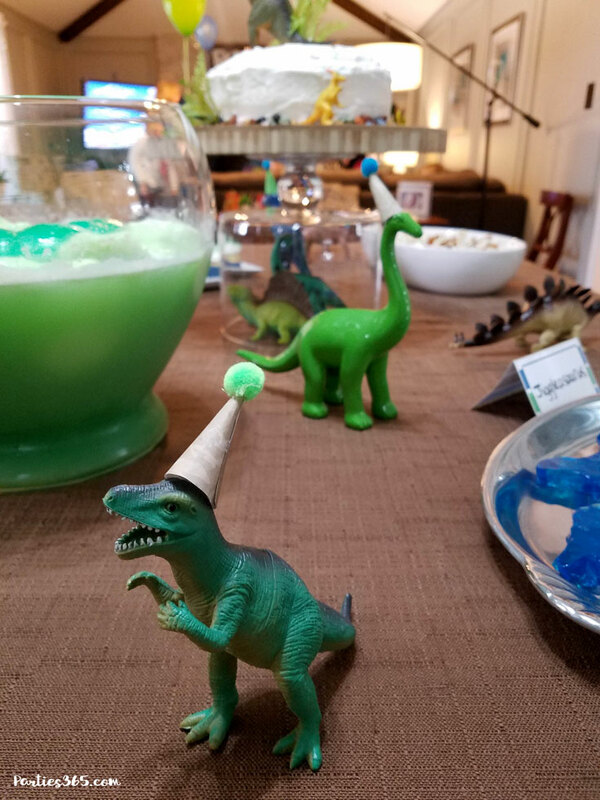 I just love the blue ceramic T-Rex and the green ceramic Brontasaurus wearing party hats! Four year olds are really easy to please, so I didn’t need to go overboard with activities and games to keep them busy! 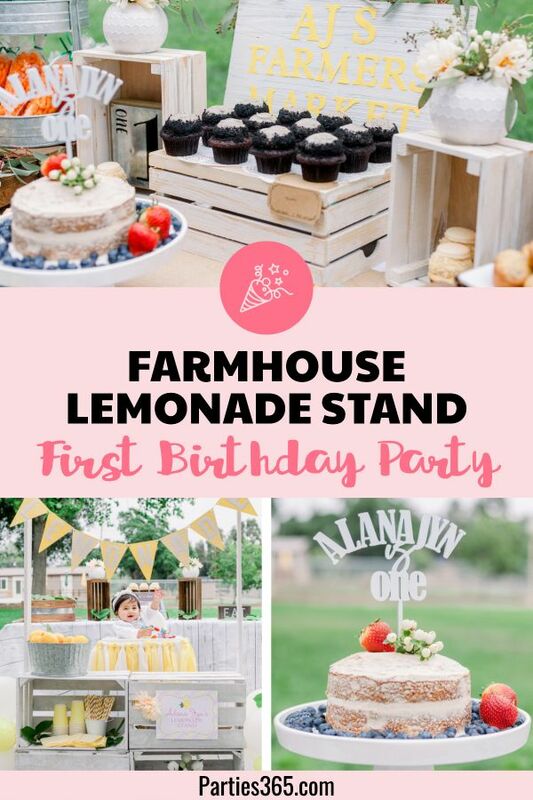 I planned a few different things for them and my kids helped me do the prep in advance so party day was easy to setup. 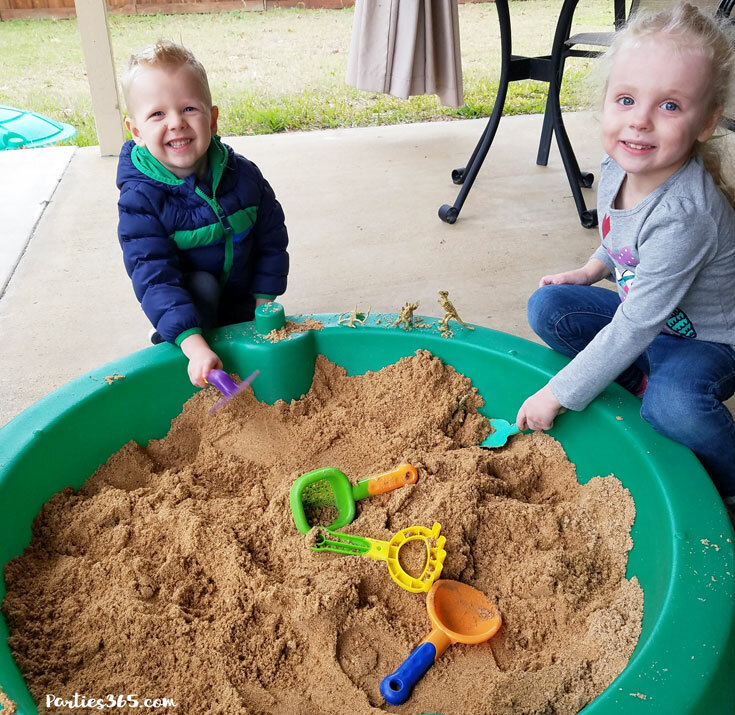 Dinosaur Dig: My son absolutely loves the sandbox, so setting up a dino dig for him was a no brainer! I found some plastic dinosaur skeletons (you can see 3 of them sitting on the edge of the sandbox between the kids) and hid them in the sand, along with some other small plastic dinosaurs, threw in some digging tools and voila, dino fun! 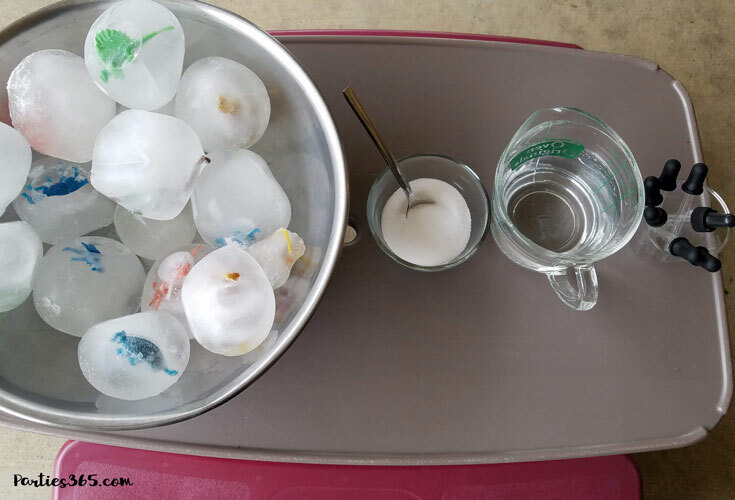 Dinosaur Eggs: Oh my goodness, the kids had so much fun with this activity! 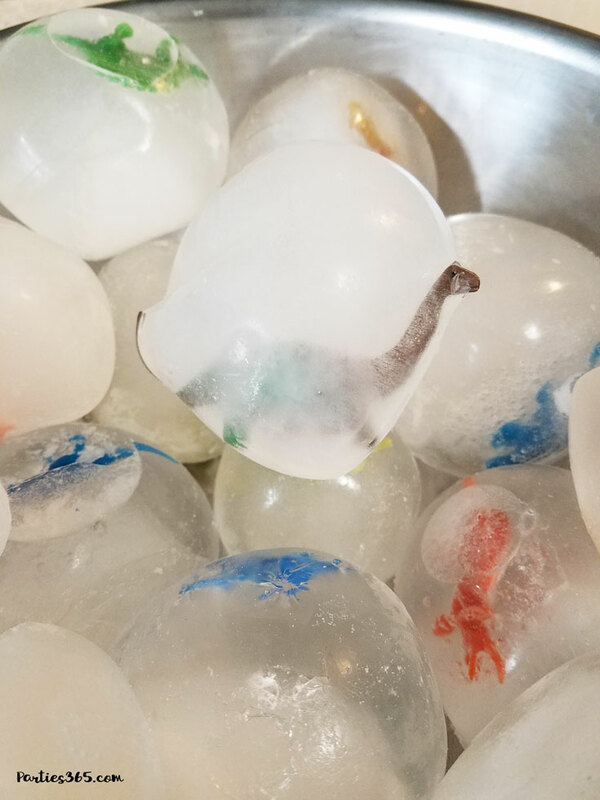 A few days before the party my kids helped me carefully tuck miniature plastic dinosaurs into balloons which we then filled with water and froze. The next day, I tore off the balloons and got these awesome looking ice dinosaur eggs! 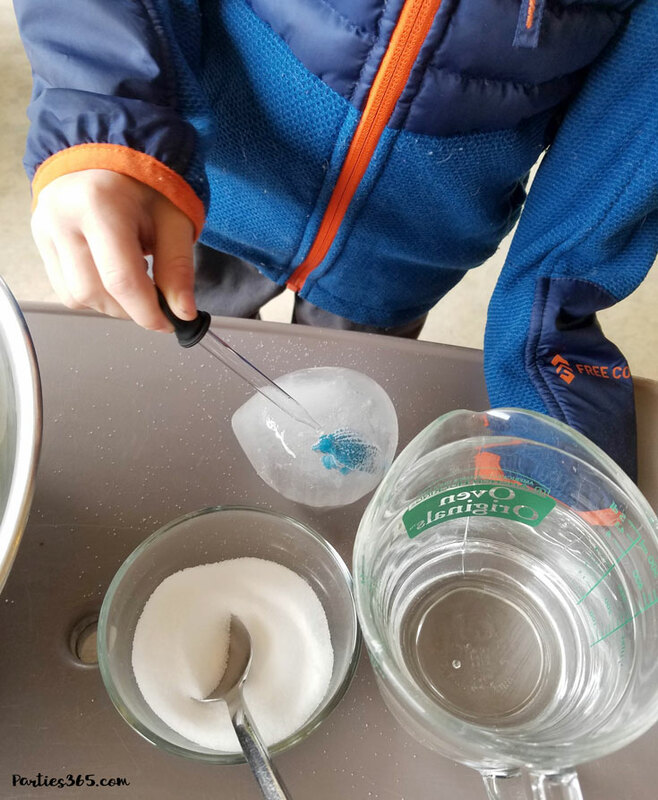 I set up a station and set out the ice eggs next to some warm water, salt and pipettes for the children to use to break down and melt the ice. They also had some small tools to bang the ice, but honestly, most kids resorted to throwing them down on the concrete and trying to smash them open. It was a lot of fun! Dinosaur Fossils: The last station I had set up for the children was a salt dough fossil making station. 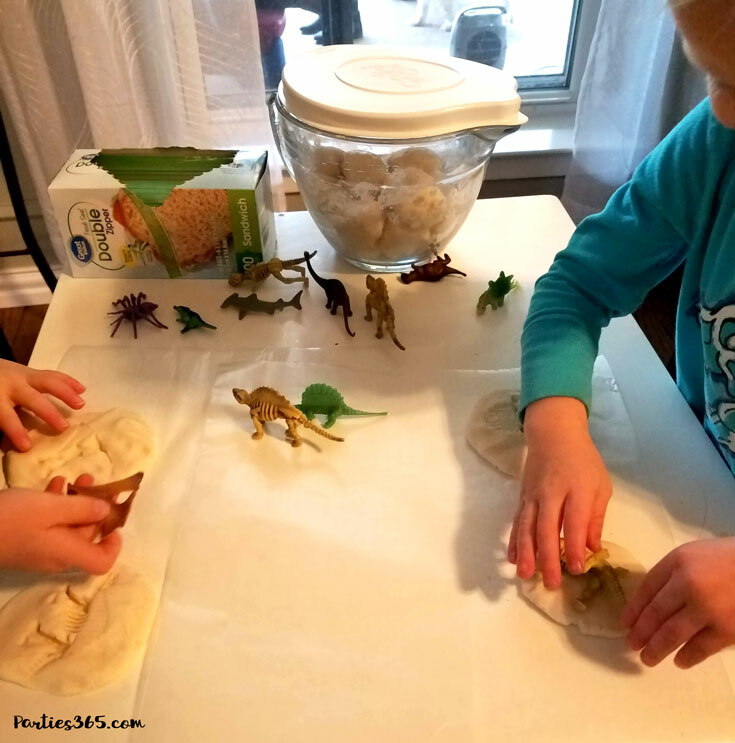 I gathered up more plastic dinosaurs, some of the dinosaur skeletons and other plastic bugs, sharks and interesting looking small toys I found around the house and set them out on the table with pre-made salt dough rolled into balls (inside the mixing bowl). All the kids had to do was grab a ball, flatten in out and press a toy into the dough to cast the fossil. They put their finished creation into baggies to take home. At most of my children’s birthday parties I make themed sugar cookies as favors for the guests to take home and this party was no exception! 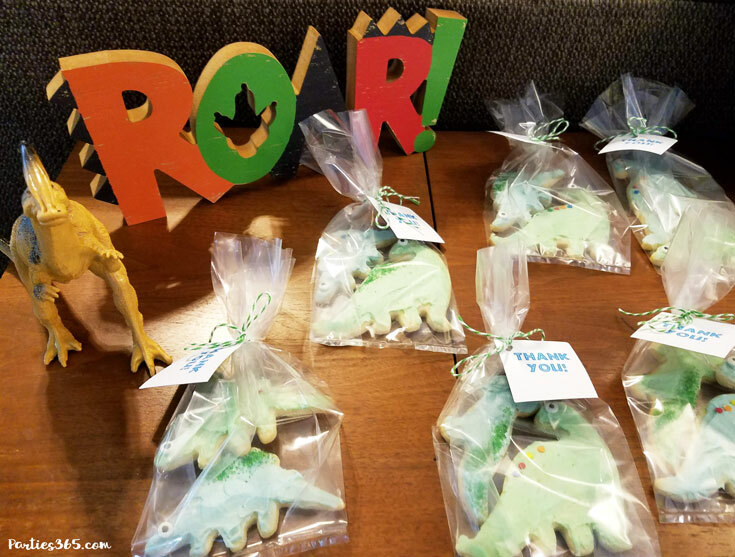 I found an adorable set of Dinosaur Cookie Cutters at Hobby Lobby and frosted some blue and green brontosaurus, stegosaurus and t-rex cookies for guests to take home. 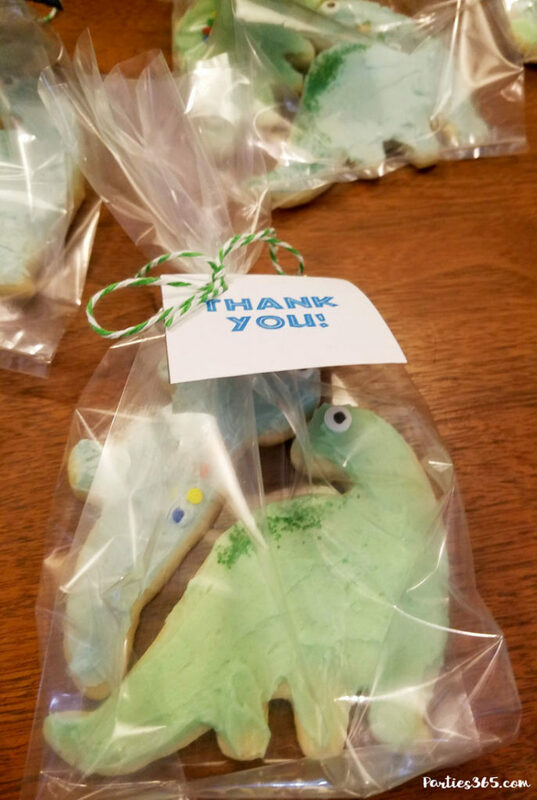 I used the Thank You tags from our Dinosaur Party Printable Pack to tie up the cello bags for guests grab on their way out the door. How awesome is that wooden ROAR sign by the way?! It’s now decor in my son’s room. 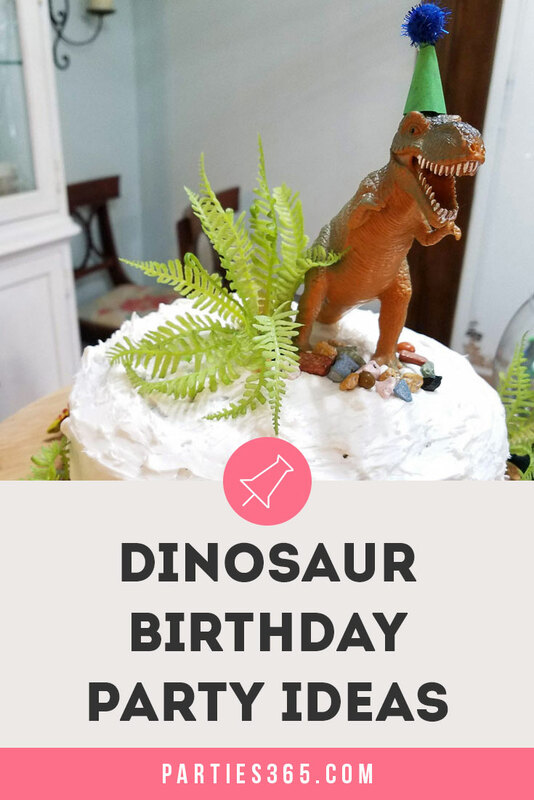 I hope you were inspired by this fun DIY Dinosaur Birthday Party! 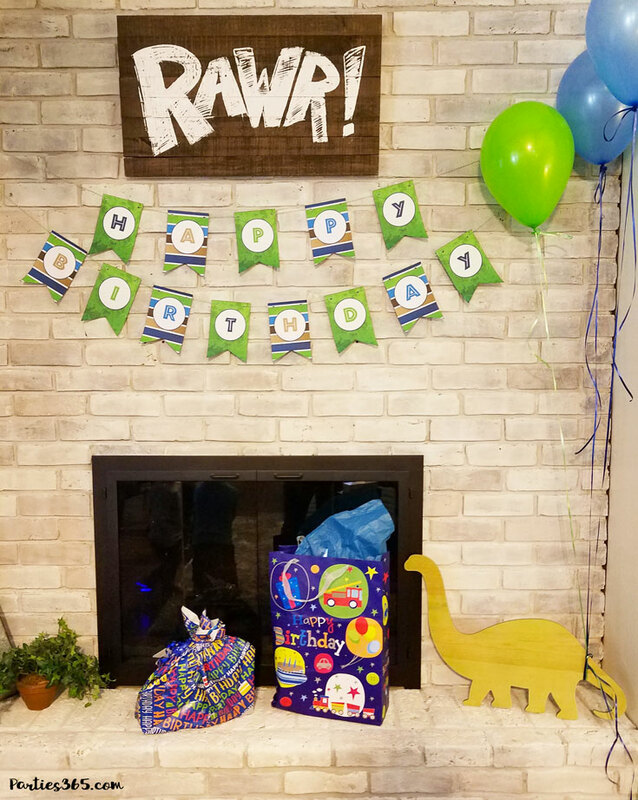 Be sure to download the Dinosaur Party Printable Pack to make decorating your next party a breeze and Pin this post for later party planning too!